The festival management team is keen to hear from any organisations or individuals who are interested in sponsoring the event in 2008. After two events the Rocket has a fantastic reputation across Europe particularly in Spain and the UK. 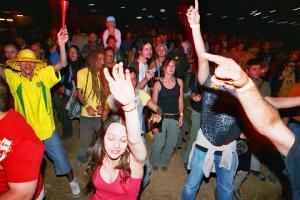 More than 6000 crew and festival-goers are expected during the 3-day event in May. The Rocket has a very effective web presence via this website and the Myspace page. Try searching for 'festival spain' in Google to see how visible we are. Association with and exciting and diverse new music and arts experience with an unparalleled underground reputation. Web advertising to thousands of unique visitors a month. Print advertising on hundreds of thousands of flyers and posters in Spain and the UK.